We are a professional Estate and Business Liquidation Company with over 25 years in the industry. We are knowledgeable in every aspect of the liquidation business. We strive to be the very best! We offer many different services. See our wide range of available services under "Why Hire Us?". Whether you need a full fledged estate or business liquidation sale or would like to consign full or partial estates or collections, we are a one stop liquidation business. We also offer personal estate sale consultations for the do-it-your-selfers! We also offer complete appraisal services for estate planning, insurance purposes or divorce proceedings. This includes videography and photography of complete household contents, including vehicles, jewelry, coins and all other assets associated with the estate. No matter the size of your estate, everyone should have an appraisal and video of all assets owned by the estate. Assets can be added or removed at anytime. Call to schedule your appointment today. 100% money back guarantee. Fall is filling up fast. We have a few slots open in the coming weeks. Make sure you get your sale scheduled soon! Call for info. 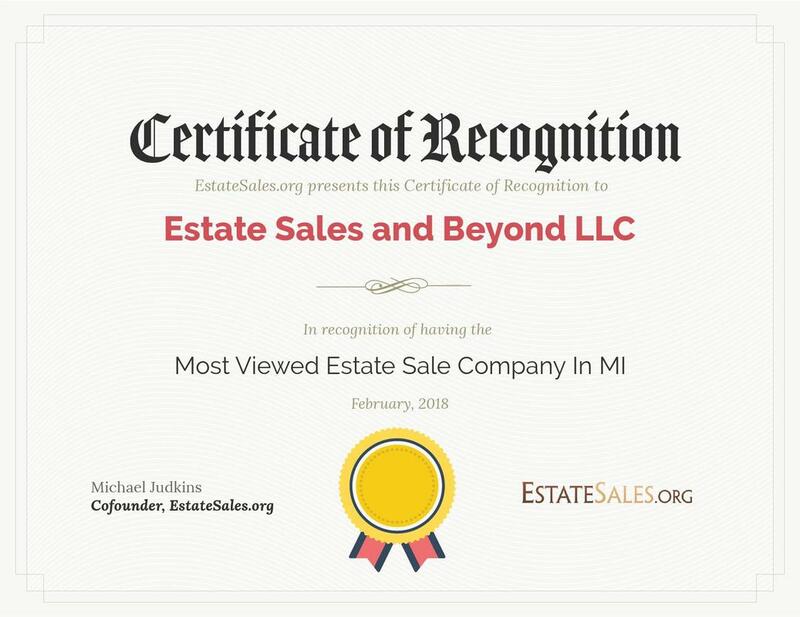 If you just can't wait for our next sale, please come see us at our Resale Showroom in Farmington: www.estatesalesandbeyond.com/showroom.html We have 6000 square feet filled with great items for sale.